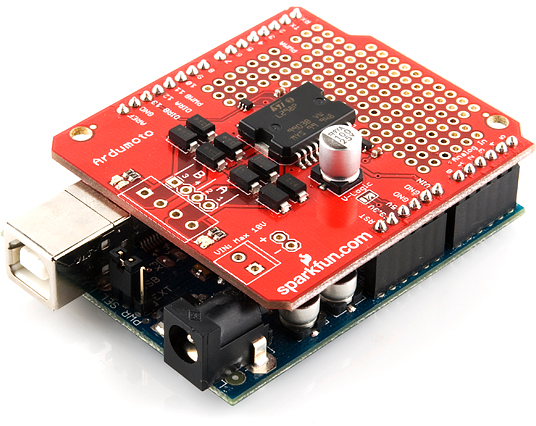 The Ardumoto Shield is an easy-to-use dual motor controller for Arduino. Combined with an Arduino, the Ardumoto makes a fantastic controller platform for RC vehicles or even small autonomous robots. At the heart of the Ardumoto is an L298 dual full-bridge motor driver, one of our favorite motor drivers around. It's able to drive two, separate DC motors forwards and backwards at up to 2A each. In this tutorial we'll go over some of the basics of both the Ardumoto and the L298 living on it. Digging deeper, we'll get into some assembly tips, and finish with an example Arduino sketch. To follow along with this tutorial, you'll need an Ardumoto Shield and an Arduino or Arduino-compatible development board. In addition to those, you'll also probably want a couple of DC motors to drive. The Ardumoto can control most small DC motors, like any of those in our DC motor category. Motors are also already included with many robot chassis, like the Magician or Tank Chassis. Finally, you'll need a handful of connectors to get everything wired up together. We recommend Stackable Headers to connect your Ardumoto to your Arduino. And two or three 3.5mm Screw Terminals to help connect motors to your Ardumoto. Motors and Selecting the Right One - Learn all about motors before learning how to control them. Arduino Shields -- This tutorial provides an overview of shields in general. It also contains an assembly guide for attaching headers to your shield. Pulse Width Modulation (PWM) -- PWM is used to control the speed of our motors. How to Solder -- Through Hole -- To electrically secure the connectors and headers, you'll need to solder them to your shield. Voltage, Current, Resistance, and Ohm's Law -- When we dive into the L298, it'll be good to know the basics of voltage and current.